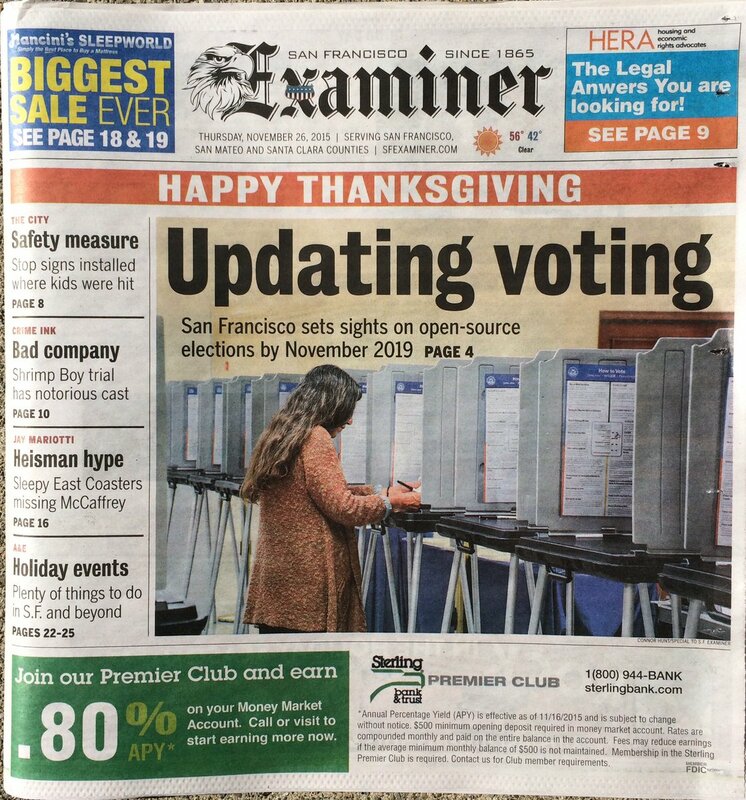 OSI Affiliate Member, the California Association of Voting Officials (CAVO), has shared some exciting news regarding their advocacy work in San Francisco: according to the San Francisco Examiner, the city of San Francisco is pushing forward with plans to develop their open source election system. Update on San Francisco's Open Source Voting System! As many may know, the OSI has been involved in supporting the adoption of an open source elections system in San Francisco, California. The following is an update from Chris Jerdonek, Elections Commissioner & President of the San Francisco Elections Commission. 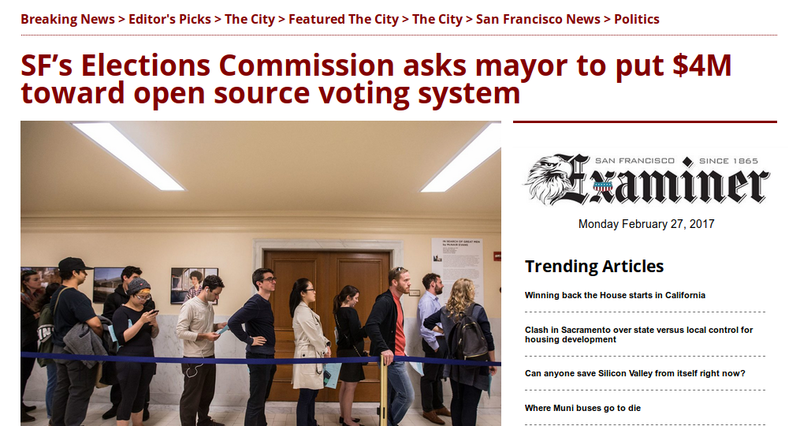 Read more about Update on San Francisco's Open Source Voting System! The Open Source Initiative (OSI) is pleased to announce our 2017 election and seeks your nominations for candidates to serve on the OSI Board of Directors. This year, 2017, three (3) Individual Members seats are open, and one (1) Affiliate Member seat. Thank you, ...we’re not there yet. “Not there yet...” that phrase actually highlights where we are with several important initiatives here at the OSI and even with open source software broadly. First, and most pressing for us today, we’re not there yet in our fund raising goals for 2016, and we’re asking those working with open source software—those who not only understand the technical merits, but value open principles—to contribute and help fund our ongoing work. 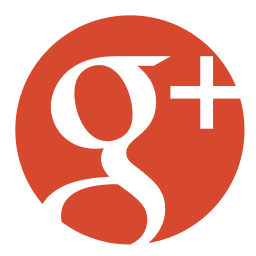 Read more about Thank you, ...we’re not there yet. 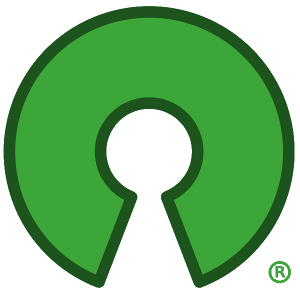 This year you're probably inundated with requests for financial support from a variety of very worthy causes, including many from open source software projects, and other organizations working to promote software freedom. 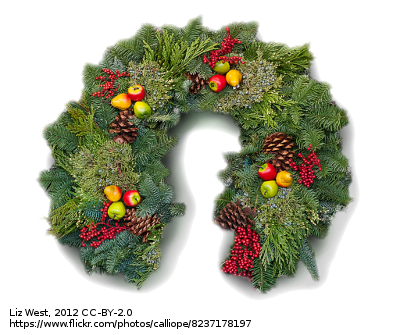 Indeed we here at the OSI are running our own end-of-the-year fund raiser, and we hope you will contribute. 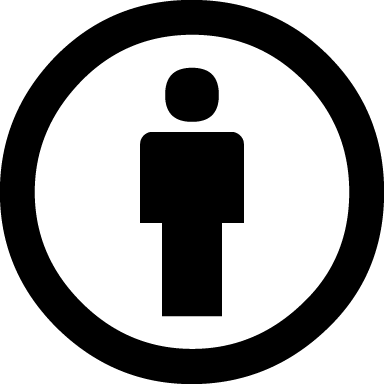 Thanks to a single staff member, ten volunteer board members, and dozens of interns, volunteers, and members, the Open Source Initiative (OSI) protects and promotes open source software, development and communities, championing software freedom in society through education, collaboration, and infrastructure, stewarding the Open Source Definition, and preventing abuse of the ideals and ethos inherent to the open source movement. Hello fans and followers of open source voting in San Francisco! The Open Source Initiative works with a variety of organizations to promote the adoption of open source software throughout government. San Francisco Elections Commissioner Chris Jerdonek provides the OSI with a breakdown of the latest happening with San Francisco's efforts to develop and certify the country's first open source voting system! Read more about Hello fans and followers of open source voting in San Francisco! 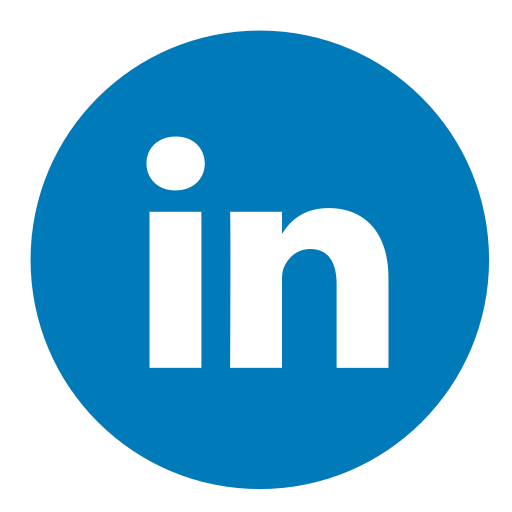 The Open Source Initiative® (OSI), the stewards of the Open Source Definition and the community-recognized body for reviewing and approving open source licenses, is announcing the affiliate membership of Open edX, the open source platform originally developed by edX.